Completed British 19th C, except portraits, Portraits: British 19th C, Continental European after 1800 25 comments Who painted 'Judith with the Head of Holofernes'? Does anyone have any suggestions about the artist of this work? This discussion is now closed. The painting is listed as the work of Heinrich Schwemminger (1803–1884), and the execution date 'exhibited 1868'. If more information about a preparatory drawing, or the painting's owner Alexander Sim, is found, please propose a new discussion by following the 'Start a discussion on Art Detective' link on the artwork's Art UK page. The painting is called "The head of John the Baptist"
An odd picture, 19thc French ?, for the GAC to have: are there any further details of the circumstances of its acquisition in 1977? Judith is a character in the Old Testament of the Holy Bible. But such is the modern obsession with changing interpretations, the name Holofernes is suspect. Holo-caust, Holo-gram is the fake imagery conjured up by a burning fire. The fernes is like the inferno described by Dante, a vision of Heaven and Hell. When Salome tempted her father Herod to have John executed the blood was spilt because he was beheaded. The Renaissance was full of Biblical references in Italy and beyond the rest of Europe. However i am not aware of how Judith fit into this story in the New Testament. So perhaps atheistic modernisers should remember that some of us are Christians and do not want our religion to be inverted by black propaganda. Thank you very much for the suggestion to check the print collection in the Bibliotheque Nationale. We are currently investigating the provenance of this painting but have not found anything concrete yet. An old label on the stretcher seems to imply that the painting was in Vienna possibly in the late 19th- early 20th century. Could this be by Edward Armitage (trained with Delaroche) - there are similarities with some of the figures in The Festival of Esther (Royal Academy collection). Many thanks for all your help and suggestions! A very interesting possibility! I will definitely check the article and look forward to hearing what Julia Armitage thinks about the painting. Edward Armitage is an interesting suggestion but I can find no record of Armitage either painting or exhibiting a 'Judith with the Head of Holofernes', although he did include this subject in his 1872 'Dream of Fair Women: Women of the Old Testament' (panel 1 on ArtUK website), now in Hastings Library. A very different Judith but some similarity in head of Holofernes and colours of Judith's clothing. Armitage usually signed or initialled his work - often difficult to see. Is there definitely no signature on the painting? I am puzzled. I have no recollection of the painting having been purchased during my short solo curatorship of the GAC 1976-78: is it catalogued in the very first published lists of GAC purchases which I wrote? Have you contacted my successor, Dr Wendy Baron? If it came to the GAC before my tenure, my predecessor Richard Walker, obliged to type his catalogue details himself at home (like me, no qualified assistance! ), only entered the barest details; maybe earlier auction records may help. Or there is the possibility that it was left behind by some ambassador/minister/civil servant retiring, who 'forgot' it. The first record we have found of the painting is when it was collected from Southbridge House (then GAC HQ) and hung in Lancaster House in 1977. At that time the painting apparently had no number and no accession record in the Collection. It was subsequently documented and given an accession number in about June 1984 (while still in Lancaster House). We will keep looking through our records and check for any signature and let you know of any developments. I expect that this occurred - in one of those shameful squabbles I endured with civil servants over modern art - in defiance of the then Foreign Minister's personal approval for my hang of modern British art for two international conferences at Lancaster House in early 1977 - while away on leave, and without my knowledge, the dep.perm.sec at the FO had all the Modern British paintings removed, and rehung with what I was not permitted to see. How the role of the GAC curator has changed today, thank goodness! The painting is clearly correctly identified as 'Judith with the Head of Holofernes' and is not a depiction of Salome with the head of John the Baptist. Judith decapitated Holofernes with a sword: we see the sword in her right hand. We also see her maid behind her. Salome asked for the head of John the Baptist on a platter: there is no platter in the painting. Salome didn't cut off John the Baptist's head: he was beheaded in prison and then his head was brought to her. I think Edward Armitage is a better bet than William Hilton II, but wouldn't put my money on it being by either of them. Following a close examination of this painting, we discovered that it bears a very faint signature on the lower left. There is also an old label on the back of the painting bearing the same name. Therefore, we are happy to confirm that the name of the artist is the Heinrich Schwemminger (Vienna 1803-1884). We also found that this painting was exhibited in the Vienna Kunstlerhaus between 1.9.1868 and 15.11.1868 and that it belonged to Alexander Sim (London). It was numbered 865, and the same number is stamped on the back of the painting on the stretcher. Thank you everyone for your help and comments. If anyone knows of a preparatory drawing or any further information related to this painting or its owner Alexander Sim, we would be very grateful for your input. Thanks for your comment, Government Art Collection. I have changed the artist of this work to 'Schwemminger, Heinrich, 1803–1884', and the execution date to 'exhibited 1868'. The work will appear corrected in the near future. I will leave this discussion open in case more information about a preparatory drawing, or the painting's owner Alexander Sim, can be found. Thank you very much, Jade. The painting might be several years older than the exhibition date suggests. In 1859, Schwemminger had already exhibited a painting called “Judith” at the Akademische Kunstausstellung. It is described as showing ‘Judith holding up Holofernes head in triumph, while her maid insists that it’s time to leave’ in a contemporary newspaper article. And a “Judith” by Schwemminger is mentioned again in 1869, when he exhibited a painting called “Götterfreund”. The article states that he had wanted to exhibit this painting the year before (at the Kunstlerhaus in 1868), but couldn’t finish it in time, so had to exhibit two older compositions, one of them the “Judith”. Thank you so much for this very helpful piece of information and for the newspaper cuttings, Andrea. Very grateful for your help and will start piecing together all the information that we have so far. This discussion has been linked to the Continental European after 1800 group. This work never did look like it was British and suggested a continental artist or one trained on the continent. My first thought was that it might be a mid-century American artist who studied in Europe. Once the GAC realised the painting was signed and had labels, the painter came into focus and thanks to Andrea we have the exact reference to when Heinrich Schwemminger (1803-84) exhibited this work in Vienna. So problem solved. It is unusual to have in a UK collection an oil painting by a Nazarene-inspired painter who later became a stalwart of the Vienna academic art establishment. Examples of Schwemminger's drawings are in the BMP&D and the Ashmolean (an article in their newsletter and more information on Schwemminger's drawings can be found via these links) http://oldmasterdrawings.net/2012/06/heinrich-schwemminger-ferdinand-schubert/#.WBG3pckZZ7s and http://vivantedrawings.com/heinrich-schwemminger/. Schwemminger's family connections include a brother, Joseph, also an artist and his relation by marriage, Franz Schubert. Nothing else has emerged about the owner Alexander Sim so there are avenues that the GAC can pursue, as well as perhaps placing this painting in the British Embassy in Austria. I recommend that this discussion is now closed. 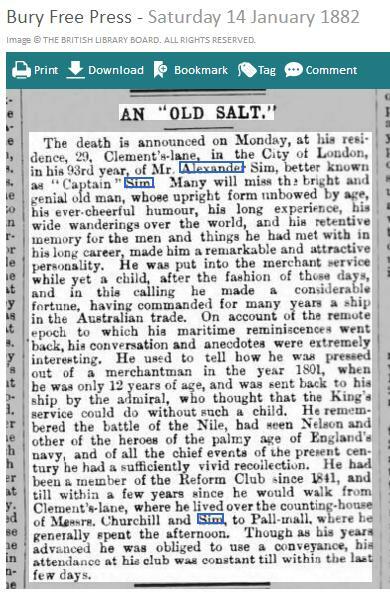 The only suitable Alexander Sims I can find in London c1850-70 - but this is essentially a matter of wealth/status - were a retired master and shipowner of the merchant marine, Alexander Mitchell Sim (1788-1882); and his nephew and probable heir Alexander Sim (1820-1885), a timber broker in the London firm founded by his father John (1782-1863), Alexander Senr's elder brother. The brothers were born in the City, sons of an attorney of the King's Bench, and while John went into trade in the Square Mile, Alexander was sent to sea at a young age. He subsequently owned and commanded an 1834-built barque, the Palestine, which in the late 1830s/early 40s was sailing regularly between England, Brazil and Australia. By then the main cargo seems to have been emigrants, but in one trade or another - perhaps timber from Brazil - he apparently made a tidy sum during his career as an owner/master. In the late 1840s he retired from the sea, and from the 1850s lived between the City and a largish house on Wandsworth Common. He never married or had children, unlike his nephew who nevertheless seems to have part-lived with him in the City, and was his sole executor. He left personal estate when he died worth a very substantial £79K. An obituary attached. Meanwhile the London-based timber business had flourished, the elder brother John having died in 1863 worth an even more impressive £120K. His son the younger Alexander took over the reins and by the time he died in 1885, barely outliving his uncle, his wealth was put at a stonking £170K. So either of them is a possible candidate for the picture's owner, though I have failed to find any evidence that either was a collector. The only vague artistic connection is that in 1881, the year before he died, "Captain" Sim (as he was often called) sat for a rather good portrait by Frank Holl - see http://bit.ly/2fd2Pyz . But this was not his commission, it was that of the Commercial Dock Company, of which he'd been a director for many years. Other than that the only thing I will observe is that owning a painting of a rather terrifying woman holding a man's severed head would be quite appropriate for a man whose life choices successfully avoided much in the way of female company for over 93 years! Thank you, Osmund, for suggesting these possibilities. This gives the GAC plenty to work with. I still recommend this discussion is closed. Thank you very much for this piece of information, Osmund. Very helpful and will look into it.